Jubin J. Sharifi, is the founding attorney at the Sharifi Firm, APC. He graduated from California State University Northridge in 1996, with a Bachelor of Science degree in Business Administration, with an emphasis on Finance and Marketing. In 2000, he received his J.D. from Southwestern University School of Law, located in Los Angeles California. Jubin was admitted to the State Bar of California in 2001 and is also licensed to practice law in the State of Florida. 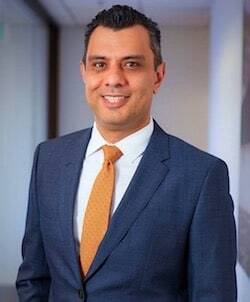 Jubin clerked in the Los Angeles City Attorney’s Office, defending the City of Los Angeles against civil claims made against the city in a variety of cases, such as police shootings, trip and fall accidents and other types of injury claims. Also, while in law school, Jubin also clerked at the Los Angeles Public Defender’s Office representing individuals charged with crimes. Immediately after graduating Jubin founded Sharifi Firm, APC, and began representing injury victims. Since then, he has successfully represented thousands of clients and recovered millions of dollars from the big insurance companies, municipalities, corporations and other individuals for their wrongdoings. Jubin’s passion is to help victims of wrongdoing and get them a fair compensation.